Don’t get locked out! 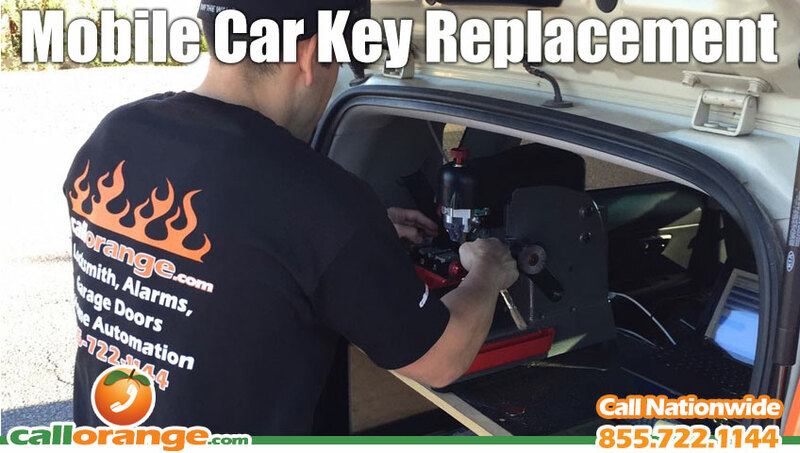 CallOrange provides fast mobile car key cutting, key duplication and programming. We can make you new car keys or duplicate and program existing keys so you always have a spare. We’re available 24 hours a day, seven days a week for emergency auto locksmith services. We can open your locked vehicle doors quickly and make new car keys for different vehicle makes and models. Need a transponder key replacement or program Key FOB? We can replace your high security car keys with a new door lock remote and program the computer chip for you. Don’t take time out of your day to go to the dealership, wait for an appointment or pay car dealer prices. Our mobile locksmith technicians come to your home, work, or wherever you are at a time that is convenient for you. We can laser cut you new key on the spot and program it for you. Worn out or stuck car door locks? Our mobile car locksmiths can also repair or replace your car door locks, repair broken trunk locks or extract broken keys from a lock. We can also fix or replace broken ignition cylinders.